When I decided to throw my friend’s baby shower I immediately started searching Pinterest and Google for inspiration. 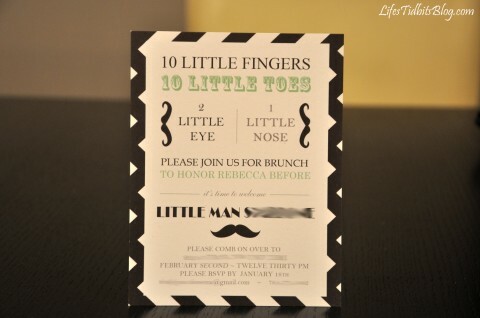 I quickly fell in love with all the details of “Little Man” aka “Mustache” baby shower / birthday parties I found. With the theme chosen the search for an invitation began. Although initially the plan was to purchase pre-made invitations, I soon decided to try my hand at designing my own invitation. I figured if the design wasn’t nailed down in time I could always order one of the many available options. The invite was created PhotoShop and the mustache graphics purchased from ShutterStock. It took a number of iterations, but the end result was exactly what I had envisioned! Although I had successfully DIY’ed our wedding invitations, I wasn’t sure I would have success with baby shower invites. Before revealing the final product to my husband, parents and sister I made them promise to give me their brutally honest opinions. With their stamp of approval I moved forward with ordering the baby shower invites from Overnight Prints. When they arrived in the mail I was ecstatic and hopeful the printed version would meet my expectations. I was very pleased with the quality of the paper, printing and turnaround time of my order! I kind of wish they looked a little shiny and/or glossy, but the matted is probably for the best. In an effort to save myself time, as well as spare everyone my horrible handwriting, I reused my DIY wedding calligraphy directions to print the address and return address on all the envelopes. The font for the addresses is Lucida Calligraphy, which is a free font. The invitations/envelopes are completed and in the mail. Now it’s time to focus on finalizing the decorations, menu and shower games for the shower!! 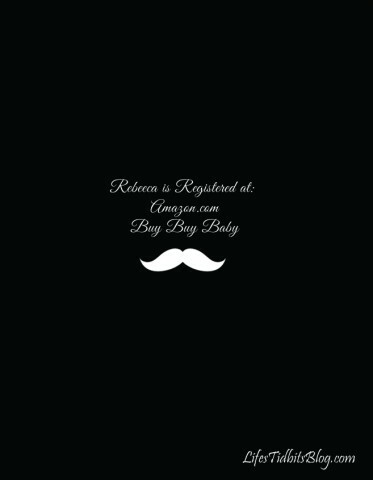 So I mustache you … what do you think of the DIY baby shower invitations? If you liked this post, please add your tidbit by commenting below! This is really cute and creative! Your friend is going to love them. Very cute, mustache printables are so fun! together with your educational blog post. I was fortuhnate too find it here. you for posting this info and That I’ve saved the website!